Other: Distinctive marks are the white ring surrounding the eye and the feathers at the base of the bill. These long feathers hide most of the red bill. The tail is a little longer than other penguins' tails. The appearance looks somewhat like a tuxedo. They are smaller than other penguin species. Their appearance is closest to the stereotypical image of penguins as mostly black with a white belly.Adelie penguins can swim up to 45 miles per hour. Like all penguins, the Adélie is highly social, foraging and nesting in groups. They are also very aggressive(punch up's happen often) to other penguins that steal stones from their nest. Groups of these have been constantly leaping on to our [ice] floe. From the moment of landing on their feet their whole attitude expressed devouring curiosity and a pig-headed disgregard for their own safety. They waddle forward, poking their heads to and fro in their usually absurd way. Adélie penguins living in the Ross Sea region migrate an average of about 13,000 kilometers during the year as they follow the sun from their breeding colonies to winter foraging grounds and back again. The longest treks have been recorded at 17,600 kilometers. The main predator of the Adelie Penguin is the Skua. The Skua is an aggressive, heavy built, brownish gull. The prey of the Adelie Penguin is manily krill, silverfish, and squid. 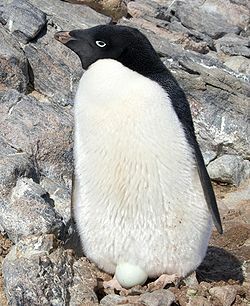 The Adélie penguin is known to feed mainly on Antarctic krill, ice krill, Antarctic silverfish, and Glacial Squid (diet varies depending on geographic location) during the chick-rearing season. The stable isotope record of fossil eggshell accumulated in colonies over the last 38,000 years reveals a sudden change from a fish-based diet to krill that started two hundred years ago. This is most likely due to the decline of the Antarctic Fur Seal since the late 18th century and Baleen whales in the 20th century. The reduction of competition from these predators has resulted in a surplus of krill, which the penguins now exploit as an easier source of food. Adélie penguins live on the Antarctic continent and on many small, surrounding coastal islands. They spend the winter offshore in the seas surrounding the Antarctic pack ice. Today the threats of global environmental change, and competition from commercial fishing, threaten the future of seabirds and Adélie penguins, which rely on sea-ice and krill. Adélie penguins also face predation by Leopard seals and killer whales at sea, and Giant petrels and skuas on land. Adélie penguins arrive at their breeding grounds in October or November, at the end of winter and the start of spring. Their nests consist of stones piled together. In December, the warmest month in Antarctica (about -2°C), the parents take turns incubating the egg; one goes to feed and the other stays to warm the egg. The parent who is incubating does not eat. Two eggs are laid, these are incubated for 32 to 34 days by the parents taking turns (shifts typically last for 12 days). The chicks remain in the nest for 22 days before joining creches. The chicks moult into their juvenile plumage and go out to sea after 50 to 60 days. In March, the adults and their young return to the sea. The Adélie penguin lives on sea ice but needs the ice-free land to breed. With a reduction in sea ice and a scarcity of food, populations of the Adélie penguin have dropped by 65% over the past 25 years.